Ανοιχτό διάλογο με τους χρήστες του facebook εγκαινίασε ο πρόεδρος τηςΝΔ, Αντώνης Σαμαράς. Ανοιχτό διάλογο με τους χρήστες του facebook εγκαινίασε ο πρόεδρος της ΝΔ, Αντώνης Σαμαράς., a photo by Teacher Dude's BBQ on Flickr. 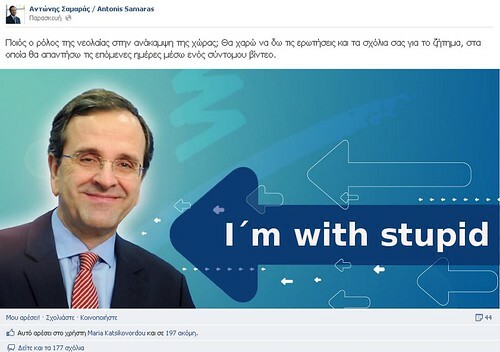 New Democracy are banking on drumming up more support in their election bid by using social media. Problem is that they have a top down command structure and rarely listen to others, all of which means their campaign is likely to flounder. 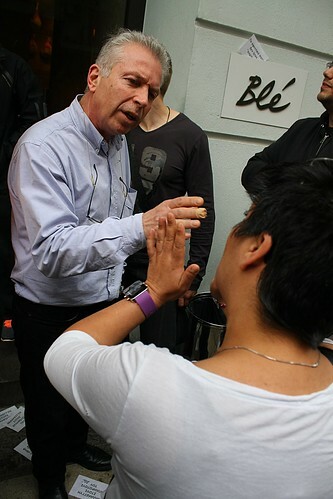 Unpaid employee arguing with supervisor over unpaid wages - Ble bakery Thessaloniki, a photo by Teacher Dude's BBQ on Flickr. At least 400,000 employees in Greece are owed a least one month's salary and with over one million people unemployed that means roughly one in three Greek are now not in paid employment. 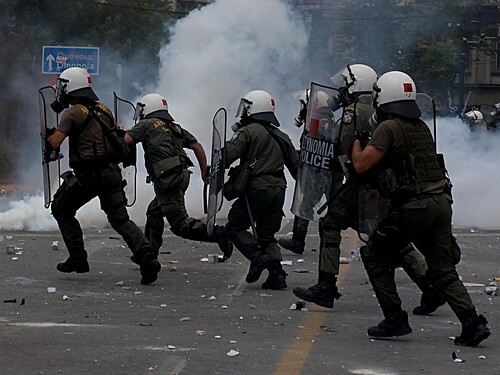 Riot squad going into action - Athens 29th June 2011, a photo by Teacher Dude's BBQ on Flickr. Is this the future of Europe? When rioting broke out in Athens in previous years it was seen as a purely local phenomenon, taken as yet more evidence by foreign press that the Greeks were an unruly and undisciplined bunch who refused to see sense. The idea propagated in much of the international press was that the the austerity measures imposed by the country's creditors were the only sensible solution for the nation and that refusal to knuckle down was was a refusal to accept reality. 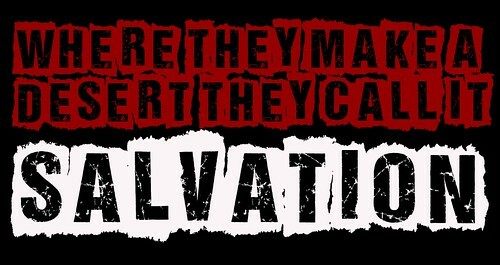 I remember being interviewed by the BBC and the first question was why the Greeks were so upset about being "saved". The reporter seemingly unaware of the harsh conditions of the bailout deal. Two years on the Greek economy is in free fall beset with a disintegrating private and public sector which is shedding jobs at an unprecedented rate. If that wasn't enough, the government's attempt to balance the books by rising taxes on everything from bread to boats has just sped up the decline. At every single juncture an increase in taxation has been matched with a fall in consumption leading to even less money flowing into the coffers. Despite two years of patent failure IMF and EU officials continue to claim that their policy recommendations have been ignored and that the Greek government has brought this disaster upon itself. Yet, in nations which have adopted troika policies more comprehensively the results are the same. In Spain and Portugal (always seen by foreign financial press as the model student) the same cycle of decline and debt is also playing out and with it a growing level of violent dissent. Yesterday's images from Madrid and Barcelona echo those seen recently in Athens and other Greek cities as young people facing a future without hope or work work out their resentments in the streets.With youth unemployment in both country's reaching 50% a potential generation gap is opening up as young Europeans start to associate the EU with poverty and joblessness. Even if the European ideal survives the current Eurozone crisis the damage done to its image in the eyes of the continent's youth may mean that it's future will be in doubt as young Europeans enter political life and see the union, not as a guarantor of unity and prosperity but an force for disruption and inequality. "Oi, shut it otherwise we're taking you in" Police to protester , a photo by Teacher Dude's BBQ on Flickr. 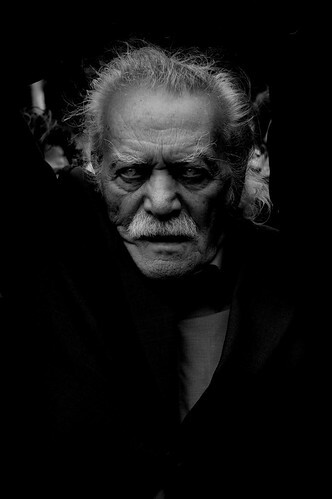 Taken during the Greek independence day parade in Athens which was policed by 7000-10,000 security personnel. Η πρώτη αφίσα του ΠΑΣΟΚ με πρόεδρο την Μερκελ, a photo by Teacher Dude's BBQ on Flickr. 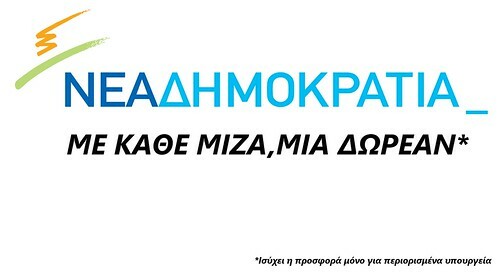 PASOK - It's possible. 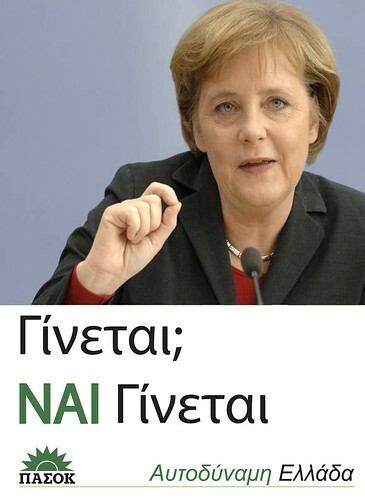 Yes, It's possible - A powerful and independent Greece. Democratic Alliance - Dora the Explorer gets political. Ετοιμη να... βγει στους δρόμους με εμφανή στόχο να τονώσει την αυτοπεποίθηση της βάσης του ΠΑΣΟΚ είναι η πρώτη αφίσα με την νέα του πρόεδρο. Most Greeks in Athens were deeply unhappy with how their Independence day parade was held this year, a photo by Teacher Dude's BBQ on Flickr. I was wrong. I had thought that the Independence Day parade in Athens yesterday would act as a catalyst for the ground swell of popular anger with the Greek government's deeply unpopular austerity measures. Instead of turning up to jeer and boo their leaders Athenians stayed away from the parade in droves. Just a fraction turned out to cheer the military units that made their way passed parliament and senior government figures. The reason had less to do with acceptance of the government's policies than the overwhelming police presence and draconian security measures that meant that no one except carefully screened visitors would be allowed within 500m of the VIP stands set up near Syntagma Square.Along the rest of the route place lined both sides of the road with riot police units literally waiting on every corner. In terms of keeping the peace the event was a complete success as no one was allowed to demonstrate anywhere near the parade, let alone bring it to a halt. All that was needed was the transformation of the centre of Athens into an armed camp with seemed to have more in common with Pyongyang than any EU capital. 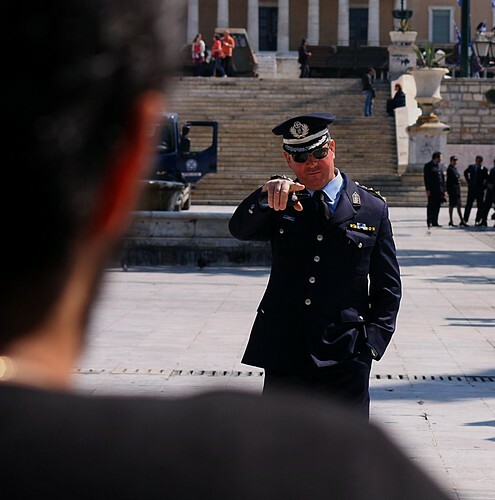 Greek media reported that anywhere between 4,500 and 13,000 police and security personnel were needed to police the parade. In other parts of Greece, less favoured by central government a very different story was playing out. In Patra, Larissa, Kozani and many other smaller towns the police were unable to muster overwhelming numbers with the result that protests went ahead leading to wide use of tear gas and clubs against people during what is meant to be a national celebration attended by all the family. However, since nothing happened in Athens the media and the government are happy that all is well in the state of Greece. They believe that that tensions can be kept in check and that come the elections, whatever party wins the most seats it will be business as usual with a PASOK - New Democracy coalition continuing to implement the terms of the troika agreements signed recently. On the ground the worsening economic crisis which shows no sign of halting is pushing more and more people to the wall as unemployment and income cuts bite even deeper. Few believe that the parties in power will do anything other than continue polices that have brought about widespread poverty and misery. Although opinion poll show a rise in support for PASOK following the election of Evangelios Venizelos as party leader and a firming up in New Democracy's numbers the results owe more to wishful thinking than a reflection of the situation in the street. According to an article in the Paron newspaper, 7 in 10 people refuse to take part in phone polls so rendering the results unreliable. Being in Syntagma Square yesterday left me with an belief that the present government is both terrified of and utterly indifferent to the opinions of its own electorate. Perhaps they really believe their own propaganda or maybe it's just the belief that if push comes to shove they have the power to impose their will, no matter how unpopular upon people. Protests mark Greek independence day parades - Thessaloniki, Greece, a photo by Teacher Dude's BBQ on Flickr. With Greek Independence day almost upon them the country's political elite has decided to put on its bravest face and take part in the military parade that marks the event. However, the rare public appearance by so many government officials is a security nightmare as the authorities are faced with the possibility that enraged voters will take the opportunity to once more attack politicians as happened a few weeks back on the Greek island of Rhodes. 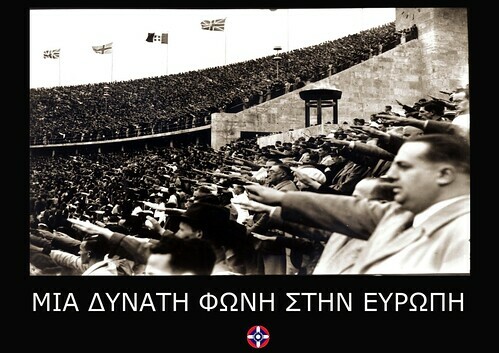 As a result nothing is being taken to chance in the run up to this weekend's parades in Athens. Local media reports on the number of police and secret service personnel on duty vary from 4,500 to 13,000, with anything up to 3000 riot police on standby ready to intervene with tear gas in case of trouble. Evacuation plans for government officials have been drafted and the orange trees that line boulevards of central Athens are being stripped of their fruit lest they be used to pelt cabinet members. The police have warned that they will be carrying out random bag checks and anyone found in possession of eggs, tomatoes or yogurt could face arrest. Even the media have come under closer scrutiny as the Greek government has demanded that only those accredited by Athens city council be allowed access to the parades, an unprecedented move. 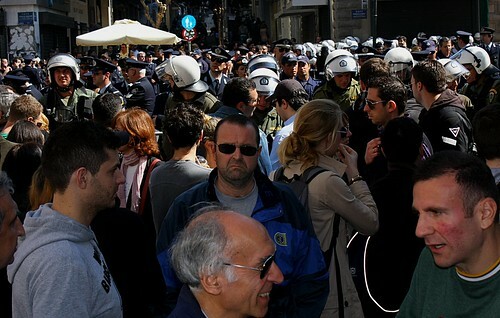 The draconian security measures are designed to avoid a repetition of the PR debacle suffered by the previous Papandreou government during 28th October military parade in the northern port city of Thessaloniki when the president was forced to flee the VIP stand after angry protesters temporarily shut down the parade. While no one knows how Sunday will play out the potential for conflict is extremely high as an angry electorate, feeling betrayed by its political rulers comes face to face with those they feel responsible for their present plight. darker voices even talk of deliberate provocation, with the idea that scenes of violent clashes will allow the present government to put off elections and so avoid a humiliating defeat at the polls. I will be present in Syntagma Square on Sunday and whatever happens I will try my best to record it both on video and in photographs. The Greek dairy producer FAGE is proud to sponsor this year's Greek Independence Day parade. The Greek dairy producer FAGE is proud to sponsor this year's Greek Independence Day parade., a photo by Teacher Dude's BBQ on Flickr. 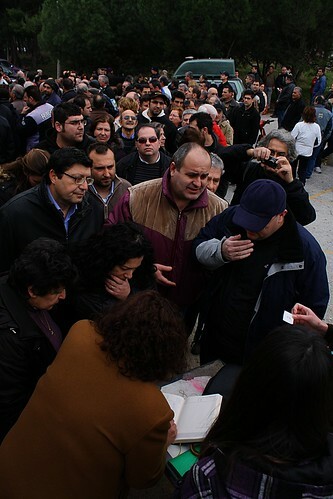 Throwing yogurt is a traditional way for Greeks to show dissatisfaction with their leaders. Given the rising levels of anger that ordinary people feel with the government in Athens, I predict dairy producers will have a field day during the annual Greek Independence day (25th March) parades this year as public officials make a rare public appearance. 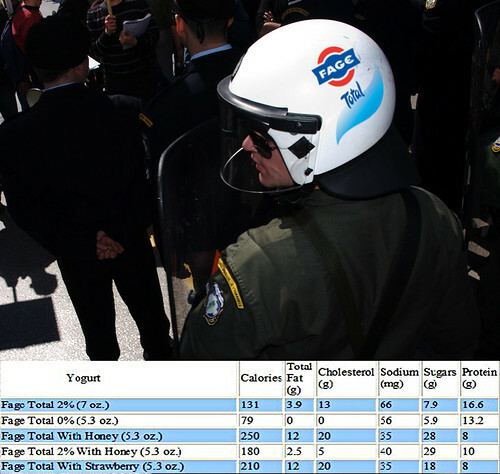 Jokes aside, this year's parade in Athens is going to be policed by 13,000 police officers and security service personnel who will be doing random bag searches to prevent the government from being pelted with yogurt, eggs or tomatoes. In addition 3000 riot police will be on standby in case of trouble. The authorities are seeking to avoid a repeat of the PR debacle on 28th October when demonstrators temporarily closed down the military parade in Thessaloniki and forced the president to flee. Less than two weeks after that event the Greek prime minister, Giorgos Papandreou resigned leading to the formation of a new coalition government led by unelected banker, Lukas Papademos. ACTIVISTA! 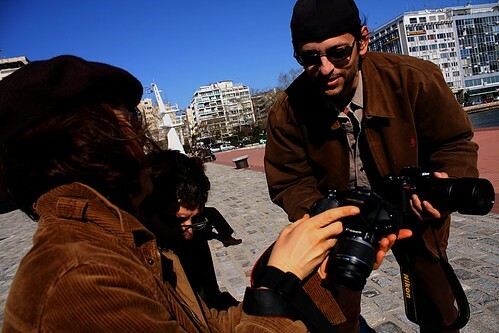 New issue by Citypulse [teaser] a video by cityfolk on Flickr. This includes some of my photographs. "Citypulse ACTIVISTA! issue, dedicated to people who express themselves for a cause." Meet our Muppets - Goldman Sachs, a photo by Teacher Dude's BBQ on Flickr. 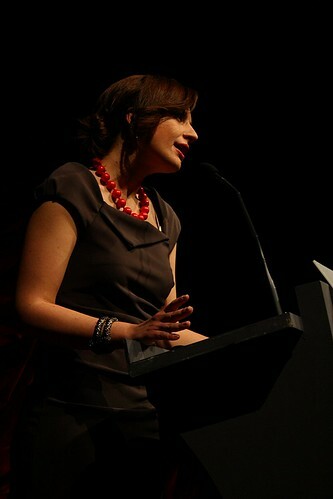 Opening ceremony - 14th Thessaloniki Documentary Film Festival, a photo by Teacher Dude's BBQ on Flickr. Thanks to the help of friends I was not only able to attend the opening ceremony of the 14th Thessaloniki Documentary Festival but also see a couple of films as well. First up was Tony Gatlif's Indignados which wove together the issue of immigration and the Indignant movement that swept both the Arab world and much of Europe last year. It's not exactly a documentary in the traditional sense as much of it was filmed in a more lyrical, filmic manner, though it does include real life footage taken in places such as Spain and Greece. I enjoyed it but I think the marriage of two themes was at best strained and occasionally looked like the two were about to go their separate ways. Both topics would have made for excellent documentaries in their own right. The second film, Interviews Before Execution: A Chinese Talk Show by Robin Newell was a more conventional documentary both in terms of approach and subject matter (albeit somewhat macabre) and dealt with a popular Chinese TV programme featuring interviews with prisoners on death row and follows their case right up the day of execution. It was an insight into a culture and mindset that is both familiar and, at times utterly alien. The makers of the series are no crusaders for the end of capital punishment but rather view their work as educational, a warning to those who would break any of the 55 laws that Chinese penal code punishes with the death penalty. Newell delicately balances the requirements of bringing a documentary that would not offend the Chinese authorities with the needs to tell his story in an honest manner and in doing so leaves the viewer to make up their own minds by being rigorously neutral in his approach to the subject. Where they make a desert, they call it salvation, a photo by Teacher Dude's BBQ on Flickr. Tacitus updated for modern economic realities. As Greece slides further into an economic downturn that matches the very worst period of the Great Depression, the country's creditors and and the domestic political elite talk of salvation, prosperity and growth. 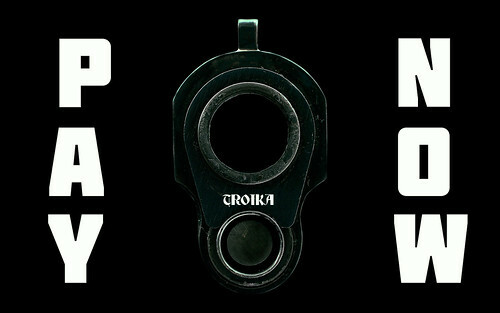 PAY NOW - The troika, a photo by Teacher Dude's BBQ on Flickr. A lion in winter, a photo by Teacher Dude's BBQ on Flickr. Un león en invierno, fotografía de Teacher Dude's BBQ en Flickr. Me sorprendió bastante ver que una fotografía que tomé en abril del 2008 estaba siendo utilizada en un diario para ilustrar el artículo. La fotografía que aparece en mi página de Flickr y en este blog está cubierta por varias licencias y, por lo tanto, no está disponible gratuitamente. En el caso de este blog, las imágenes están cubiertas por una licencia griega Creative Commons Reconocimiento-No comercial-Compartir igual 3.0, que permite que activistas y bloggers usen fotos pero requiere que se pida permiso antes de hacer un uso comercial. Ya que no soy un fotógrafo profesional, no soy un experto en los distintos aspectos del copyright, pero El Mundo no contactó conmigo para pedirme autorización para usar la fotografía. Como saben los que leen este blog, los tiempos son especialmente duros en Grecia y, como a tantos otros, mis ingresos se han reducido drásticamente durante los últimos dos años. Cuando ves una gran empresa comercial que no quiere pagar aunque sea un importe simbólico por tu trabajo, te sube la rabia. 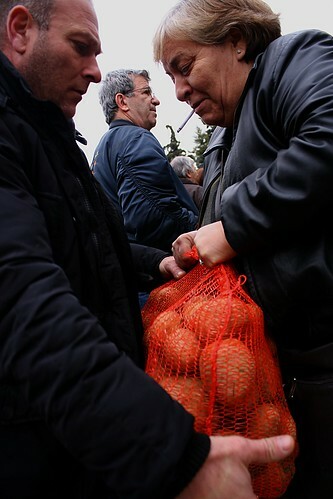 Greece's potato revolt reaches Thessaloniki, a photo by Teacher Dude's BBQ on Flickr. With incomes plummeting and retail prices rising the idea for farmers to sell their produce directly to the Greek public has proved to be an unexpected success. Producers from the northern region of Nevrokopi sold 35 tonnes to city dwellers eager to buy potatoes at less than a third of the supermarket prices. For the farmers it is a chance to sell potatoes at a reasonable price rather than be forced to accept merchants's offers than did not even cover the cost of production. In the wake of the successful experiment other producers of fruit, vegetables and dairy products are considering following the potato farmers lead. Click here for their site. VOTE NO, a photo by Teacher Dude's BBQ on Flickr. The Irish electorate will soon be called upon to ratify the terms of the country's fiscal treaty. The Irish PM Enda Kenny has said that a YES vote is necessary in order to ensure financial stability. However, the application of similar terms has brought social chaos to Greece as the real economy continues to collapse, hammered by lack of investment, rising prices and a series of crushing tax hikes. The official unemployment rate has doubled since the application of austerity measures designed to save Greece and now is 20% and rising. 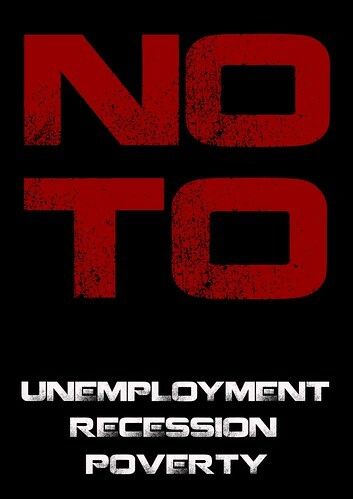 Nearly 50% for those under 24 years old and thousands are being forced to abandon the country in order to find work.. Since 2009 measures designed to reform Greece and stabilise debt have backfired, creating a death spiral that has pushed back living standards by decades. In the port, a photo by Teacher Dude's BBQ on Flickr. Still getting the hang of my new camera. Each make has its own strengths and weaknesses and it takes a while to master them. Once again a huge thanks to all of you who made this possible. 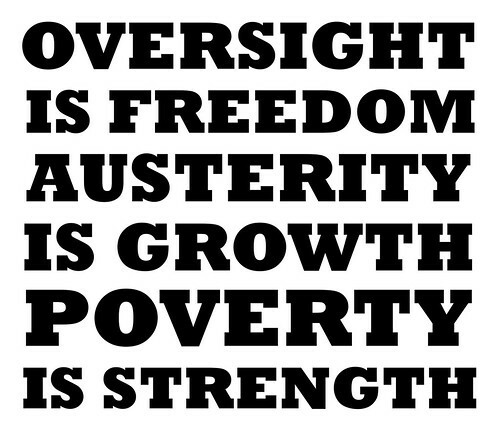 Oversight is freedom. Austerity is growth. Poverty is strength. Oversight is freedom. Austerity is growth. Poverty is strength., a photo by Teacher Dude's BBQ on Flickr. Yesterday I attended my very first show trial. I had thought that such events had gone the way of the typewriter and VCR, consigned to the trash compactor of history. 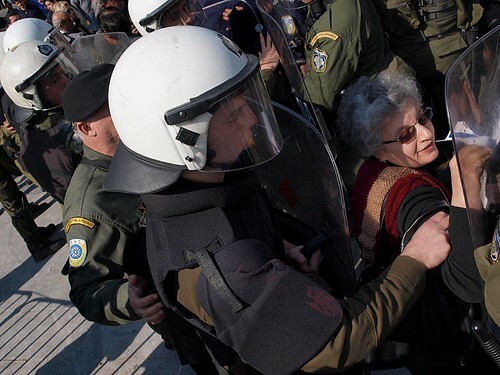 However, this particular case was more farce than fear and had a happy ending when the seven defendants were found not guilty of crimes such as insulting the person of the president of the Hellenic republic and not arresting 10,000 demonstrators on the spot. But I get ahead of myself. On the 28th October or Ohi (No) day as it known in Greece the annual military parade in Thessaloniki was temporarily halted and the Greek president, Karolos Papoulias fled the area along with other VIPs after crowds flooded into the road and started chanting anti-government slogans (see pictures above). Eventually, the reminder of the parade continued to tumultuous applause, though without any political figure present. The same scenes were repeated across Greece and the shock of the event was such that the government of Giorgos Papandreou stepped down from government a week later. However, live TV coverage of the Greek president and the local bigwigs being forced to abandon the parade was never going to be forgotten by the country's political elite keen for blood after the humiliation. Also with the Independence Day parades coming up on the 25th March some kind of message had to be sent to show who is in charge hence the arrest and trial of six protesters and one police officer present. The courtroom was full of supporters of the defendants , not to mention uniformed and plain clothes police. Just to be on the safe side, a platoon of the quasi-military riot police lolled round in the corridor next door, shields and helmet close to hand in case things got feisty. How much this particular farce has cost the tax payer is anyone's guess, but the fact that so many lawyers, police officers, court workers, witnesses and the like spent an afternoon listening to the charges that sounded more like a school yard spat that a breach of any sane law is an indication that Kafka's spirit lives on in the Greek justice system. "Did you say anything against the president?" was one of the questions I heard come from the judge's mouth and for a moment I thought it was a joke. But, no, much of the case revolved around allegations that some of the defendants had called the country's president "traitor" and "a mason". Actually, as I was there those were the least insulting things people shouted, and positively beniegn compared with the insults coming from some groups. But due to the crowds involved and the fact that the police case was about as watertight as the Titanic nobody could say with any certainty that the accused were those insulting Papoulias. The police officer faced charges of dereliction of duty since he failed to start arrest any of the 10,000 odd people who were in the streets. Given the potential for a violent reaction and the fact that the parade was full of families such a move was safe to say the most prudent and the court agreed. However you have to wonder what motivated the public prosecutor to pursue the case. Despite what we see in the movies there was no popping of champagne corks or jubilant cheers, people shook hands, thanked those who'd helped and made their way out of the building, trailed by the riot police squads.